Bachelor of Business and Information Management." Susan Tjarksen co-founded KIG CRE, a multifamily brokerage in 2015, and joined Cushman & Wakefield in 2018. With more than 30 years of real estate experience working with both private and public investment institutions throughout the country. Prior to brokerage, Susan was a leader in apartment and mixed-use development, having planned, built, designed, financed and delivered projects totaling more than $3.5 billion in revenue. She has also successfully developed and sold 12,000 residential units, 2,500 hotel rooms and more than 2M square feet of retail and office space. 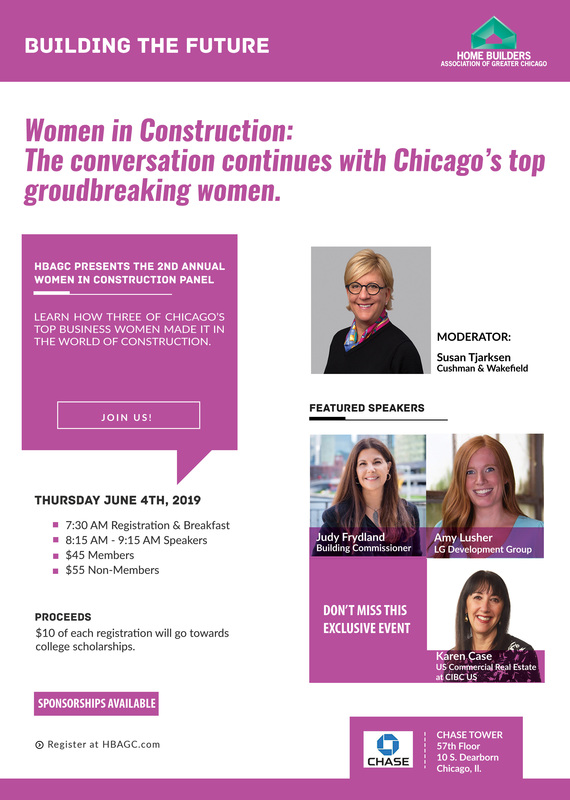 Susan is a member of the Forbes Real Estate Council, Roosevelt University’s MBIRE Advisory Board and the Lincoln Park Builders Club of Chicago. Susan holds a Bachelor of Finance from The University of Illinois at Urbana–Champaign and completed her Master’s work in finance as a Rotary International Fellow at Essex University, Colchester, England. Karen Case is Executive Managing Director and President of US Commercial Real Estate for CIBC US. She oversees the business units that develop and manage real estate finance and banking relationships with dynamic and growing commercial real estate developers, investors, owners and operators nationally. Ms. Case is a member of the CIBC US Region Executive Committee. Ms. Case joined The PrivateBank in 2007 (Toronto-based CIBC acquired The PrivateBank in June 2017) as President, Commercial Real Estate. Previously, Ms. Case served as executive vice president in LaSalle Bank's Commercial Real Estate Department (LaSalle Bank was acquired by Bank of America in October 2007). Prior to joining LaSalle in 1992, Ms. Case managed banking relationships with Midwest-based real estate development and syndication firms for New York-based Marine Midland Bank (now HSBC) and The First National Bank of Chicago (now Chase). Ms. Case earned her MBA from The University of Chicago and a BS in Business Administration from Washington University in St. Louis. She also attended The University of London and The American College in Paris. A native of New York, Ms. Case lives in Chicago with her husband, Jay. They have three grown children. Judy Frydland serves as the Commissioner of the Department of Buildings for the City of Chicago. The Department of Buildings is a 285‐person department with an annual budget of $37 million. The DOB enhances safety and quality of life for residents and visitors of the City of Chicago through permitting, inspections, trade licensing, and enforcement of the Chicago Building Code. Since Commissioner Frydland’s appointment in 2015, the Department has implemented several reforms that have streamlined the permit process for all building projects, from single-family home renovations to large-scale developments, making it quicker and more efficient to obtain a permit than ever before. In 2017, the Buildings Department issued a record 48,408 permits. Under her leadership, the Department is modernizing City code to align with national and international standards. In fall 2017, Chicago became one of the first major cities to align with the National Electrical Code. The updated code improves safety requirements, advances sustainability, brings additional energy efficiency to Chicago’s booming building industry and can lower costs on electric bills for residents and businesses. Prior to joining the Department of Buildings, Ms. Frydland spent 25 years in the Chicago Law Department working with various city departments, community groups and other stakeholders on the enforcement of building code, municipal health and business license regulations. In her role as Deputy Corporation Counsel for Building and Licensing Enforcement, Ms. Frydland enforced the city’s vacant building ordinance and implemented strategies aimed to preserve the city’s housing stock, closed down and revoked licenses for problem businesses engaging in criminal activity, actively preserved occupied residential buildings through circuit court litigation and city programs, aggressively prosecuted illegal signs and dangerous and hazardous rooftop water tanks, as well as enforced the Life Safety Evaluation (LSE) requirements for pre-1975 high-rise buildings. Commissioner Frydland is the recipient of the 2018 “Labor Person of the Year” award from IBEW Local 134 and the 2018 “Building Industry Woman of the Year in Construction” award from the Home Builders Association of Greater Chicago. Ms. Frydland graduated from I.I.T. Chicago Kent College of Law, was admitted to the Illinois Bar in 1990 and is a current member of the Chicago Bar Association. Ms. Frydland earned her law degree while working as a social worker and assistant administrator in a nursing home. Ms. Frydland also has a Master’s Degree in Community Health Care Planning and Administration. The cost is $45. $10 of each registration will go towards college scholarships.